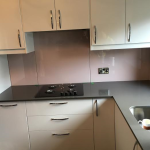 Glass splashbacks and worktops provide you with flat, hygienic and easy to clean surfaces that will eliminate dirty grout joints remove areas where mould may accumulate. 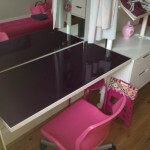 Our glass splashbacks and worktops can be drilled, polished and have bevelled edges, all carried out by us at our Newport factory, enabling them to accommodate cut outs for sockets, sinks, lighting and can have draining board grooves incorporated in them. They are extremely durable and both impact and heat resistant and as the finished colour coating is a permanent coating it will, with correct maintenance and cleaning, remain looking like new for many years of use. With no grout lines and the option to attach fittings, and install illumination behind them, our glass bath panels will give a distinctive and calming feel to your bathroom. Impact resistant glass panels, with a seamless finish, can be made to any shape at our Newport factory and are available in a wide range of RAL colours, or any paint manufacturers bespoke colour ranges, which you can choose from to blend in and harmonise with your individual design scheme. Painted glass panelling is increasing in popularity as an alternative to tiles, laminates or painted finishes in kitchens, bathrooms and hallways of domestic properties as well as in foyers, corridors, offices and washrooms in commercial buildings. Their smooth lines, ease of installation, lack of joints and simple maintenance gives a clean, modern look for an extensive period of time. Our painted glass panels can be cut to shape and can be applied to vertical, horizontal or sloping surfaces. At Acorn Glass we can let you achieve that personal touch to your glass panel whether it’s a splashback, a partition, a reception counter a shower or bath screen, or any other glass panel situation you can think of by having it printed with a picture or pattern of your choice. If you’re unsure of what you think you can achieve, our technical team will be happy to help you and advise on picture formats required for your panel size and intended location. 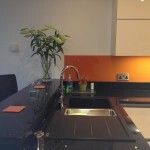 At Acorn Glass we can provide you with glass splashbacks and worktops to a colour and size or shape, of your choosing. With an extensive experience of glass cutting and colour coating at our Newport factory, and working closely with designers and architects, we are able to achieve a modern, elegant, smooth lined finish that is hygienic and is easily maintained and cleaned. At Acorn Glass we have a spraying booth at our Newport factory that enables us to provide painted glass panels to a colour of your choosing and a colour coating which is permanent, highly durable in use and requires minimal easy cleaning.